As a photographer weaned on the no less breathtaking but far more finite confines of Yosemite, transitioning to photographing the Grand Canyon shattered a long-established template for success. In Yosemite Valley I’m surrounded by looming walls as familiar as they are spectacular. Attempts to capture Yosemite’s grandeur generally involve isolating or combining specific subjects: El Capitan, Half Dome, Yosemite Falls, and so on. But when photographing from the rim of the Grand Canyon, no single subject stands out. Rather, I’m instantly overwhelmed by both the vast expanse of the vista and the enormity of its scale. The problem is, as far as the camera is concerned, breadth and size are mutually exclusive: The wider I compose to include the vista, the more everything in the frame shrinks; the tighter I compose to convey the size of the canyon’s features, the more the vista shrinks. But perhaps the greatest hurdle is the Grand Canyon’s great distance, with dramatic red ridge after red dramatic ridge seeming to continue into infinity. This visual depth is completely lost in the camera’s two-dimensional vision. While I’m not sure I’ve completely mastered the Grand Canyon, I feel like I’m finally getting the hang of it. The above sunset photographed from Hopi Point demonstrates the approach that seems to work best for me, which is to find something for the foreground that complements the background I’m trying to highlight. The Grand Canyon’s rim is rife with interesting trees and shrubs, but in this case I wanted to photograph the sun on the horizon, using the river to lead the eye through the frame. But I couldn’t find an appealing foreground subject. Since experience has shown me that something in the foreground anchors the viewer and is essential to the depth I want to convey, rather than forego any foreground subject at all, I settled for two pretty ordinary shrubs on the canyon’s rim. Because they’re not particularly compelling, I positioned the shrubs at the edge of the frame, allowing ample room for the eye to move easily along the more interesting rim and through the rest of the frame. Another difficulty photographing the Grand Canyon is the extreme contrast between the bright sky and deeply shaded canyon at sunrise and sunset, a contrast the eye handles far more easily than a camera. The best light in Yosemite Valley comes at sunset, when the sun is at your back for most compositions that include El Capitan or Half Dome. But the Grand Canyon offers an unobstructed view of the horizon in all directions–as difficult as it is to photograph, it’s pretty hard to ignore the rising and setting sun. And the canyon’s precipitous sides put much of it in deep shadow when the sun is on the horizon. For this sunset I’d arrived at Hopi Point about an hour early, allowing time to plan and set up my composition. 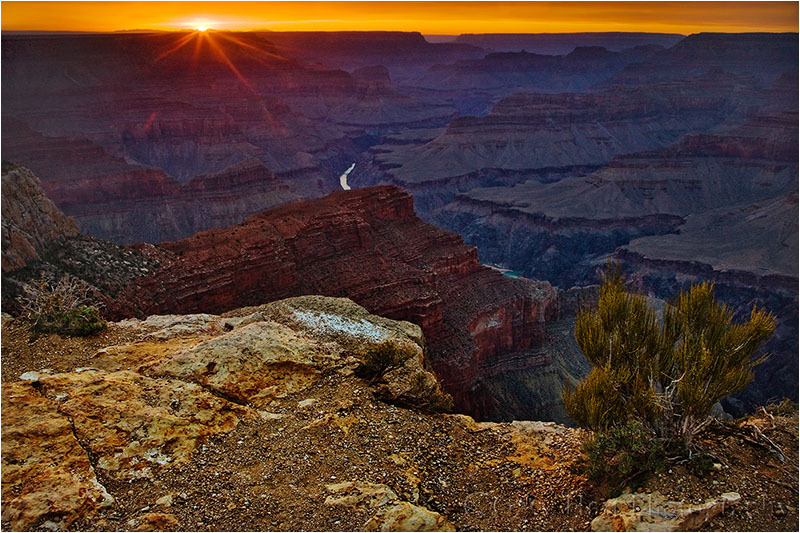 When the sun reached the horizon I combined two- and three-stop graduated neutral density filters, which enabled a long enough exposure to bring out the canyon’s shadow detail while holding back color-robbing brightness in the sky. (The Grand Canyon is a great place for hard-transition or reverse GNDs because the linear horizon is a great place to hide the dark-to-light transition.) The sunburst was achieved by using a small aperture (f18) and timing my exposure just as a thin sliver of sun peaked beneath a cloud. While I’m still not as productive at the Grand Canyon as I am in Yosemite (and other more familiar locations), I really do enjoy the challenge and am encouraged by the growing satisfaction I feel following each trip. My fingers are crossed that I was able continue this trend with the images from my latest visit. Stay tuned…. Gary, I’d never given any thought how to capture an image of anything, much less one as magnificent as the Grand Canyon. Your article really made me think (like an artist describes the process of viewing his artwork) in a way that I could comprehend. You make me want to invest in a camera and this genre! I agree with you on how difficult to shoot the GC. I was there last Nov and hardly got 2-3 shots and that also doesn’t show the Grandeur of that place. I agree with Karen. I spent a summer working part time at the El Tovar gift shop in the summer of 91. All I had was a Vivitar 35mm point & shoot, but still managed to shoot 14 rolls.The canyon is so overwhelmingly beautiful & immense. The colors change so dramatically from sunrise to sunset. I remember standing on the edge & feeling so insignificant. I had the pictures developed after I returned home. I remember thinking how they just didn’t convey how huge an expanse it is or the depth. I think hiking to the bottom in July may have added to the feeling 😉 I’m planning to go back next summer. I had a similar experience trying to photograph the Grand Canyon, and I also found that my best photos included something of strong interest in the foreground. I felt challenged in the same way at Badlands National Park. It’s challenging to capture the vastness of the landscape in a way that is interesting.